A recent research by INTI International University’s (INTI) Traditional Chinese Medicine (TCM) students revealed that properties of a local herb, Blumea Balsamifera, have positive results towards the treatment of arthritis and inflammation. Dr. Yong (6th from right) with TCM faculty members and students. This research was conducted as part of their clinical studies to discover medicinal values in local herbs, to make TCM medicine more affordable for local patients and also because there is a growing demand in traditional and complementary medicine (T&CM). “Chinese herbs used for TCM treatments are usually imported from China, and can sometimes be a costly affair due to its scarcity or high demand and value. By exploring and researching local herbs, which are more easily attainable, Malaysian TCM users can benefit from these traditional remedies without having to burn a hole in their pockets,” said Dr. Yong Kian Fui, Director of INTI’s Centre of Traditional Chinese Medicine. “We have endeavored on this journey to explore and identify local herbs that could potentially supplement Chinese herbs in TCM treatment in the country, as we believe that it will bring about phenomenal benefits not just in the TCM industry but to the healthcare industry in general,” he added. 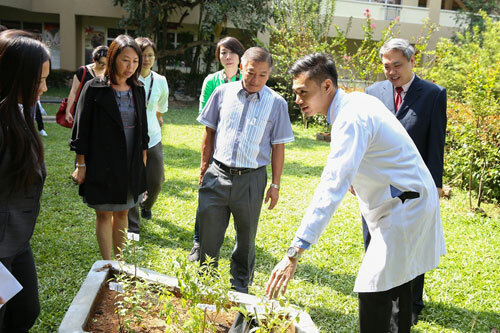 Final year TCM student briefing media on properties of herbs at INTI’s Herbal Garden. TCM has seen significant growth and demand outside of Asia, despite prevailing misconceptions that traditional medicines are regionally focused and culturally bound. One of the key reasons for traditional and alternative remedies to gradually become the preferred choice globally is the rising costs of healthcare and prevailing chronic diseases. A 2013 report released by the World Health Organization (WHO) indicated that over 100 million Europeans are currently T&CM users. Similarly, reports provided by 129 WHO affiliate countries showed that 80 percent of them now recognize the usage of acupuncture in its health care system. 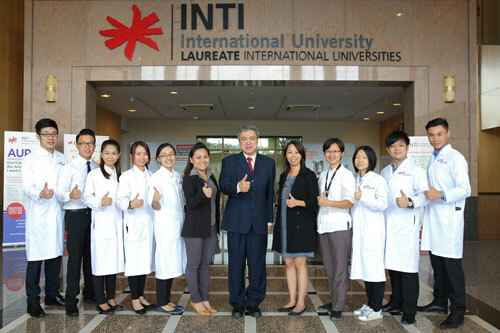 INTI International University is the first institution in Malaysia to offer a fully accredited TCM degree. One of the key benefits of INTI’s Bachelor (Hons) in Traditional Chinese Medicine is that it is taught in a dual-language mode (Mandarin and English), which enables students to look for career opportunities not only in Asia but also in Western markets.